The other night it was our two-year anniversary and since it also marks the end of another chapter for us-long distance- (Eric just finished school in Boston & I’ve been living in Los Angeles) we decided to really celebrate! Before having dinner at this adorable Italian spot, Locanda Veneta, we decided to exchange gifts and this year, I wanted to do something a little different- I decided to make my gift. Now I definitely can’t take credit for coming up with this idea, I saw it on Pinterest, as a thirtieth birthday idea and then made a couple of changes to suit it for our anniversary. In the original idea, there was a balloon and a photo for every year of the person’s life and so I decided to modify it a tad and do a balloon and a photo for every month we were together. It was really simple- just get the photos together for each month, hole punch the top of the photo and attach a balloon. I wanted to get as many colored balloons as possible to represent all the memories and moments, but you can really do whatever color scheme you want! Luckily, I take a lot of pictures and could actually find one for each and every month. It was fascinating to see how much traveling the two of us have done over the past two years, we never missed a month, and when you are living across the country that’s frequent flyer status! The project will take you a bit of time and fitting 24 balloons in my small coupe was no easy feat but it was definitely worth it! He really appreciated all of it and was totally surprised. 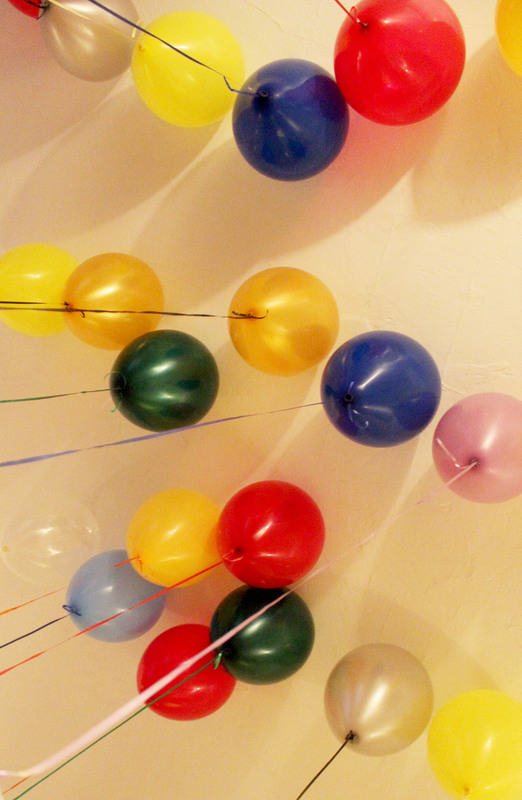 Let's be honest, I think anyone that walks into a room full of balloons unexpectedly is going to be blown away, right? Oh and side note- when I posted a photo of this yesterday, a ton of friends thought that E did this for me and were melting at the thought, so all you guys out there- if you're trying to make a lady swoon, this might just be an awesome idea. Just don't say you found the idea here! It was so much fun for us to look back at all the memories together and it’s just so important to take moments like an anniversary or a birthday to remind your loved ones how much they truly mean to you. Great friends, family, boyfriends, girlfriends, husbands, wives, cousins, roommates- if you have great people around you- let them know!